Be quiet…Be quiet, I was screaming in my head. We were driving, my parents were talking about what road to turn on, headed to the church. My dad says, “which way should we go?” My Mom says “I think we should turn here”, then dad says, “I think we should turn up there”. “Could you stop, I will tell you were to turn”, immediately feeling regret for my words, as they were just trying to get us there. They were fighting their own battle inside of themselves, their own pain. Not the pain of a spouse, but the pain of a parent. They were so close to John, he had become their son through our marriage, but also their son in every sense of the word. They loved him deeply and he in turn gave them the same love. I could feel how my words stung them. I felt even sadder for hurting them, in this time of intense pain. In my head, I was thinking didn’t they know….dont they know what I am going through right now, who cares about the stupid road we turn on. They did know, they were dreading this reality too. They were my biggest support through all of this and continue to be. So today, I feel sorry for only seeing and feeling my pain, because theirs was so great as well. On top of their loss, they were grieving for me and worried for my well being and the days, weeks, months, years and years to come without him here. Driving that last mile felt like time was standing still. I was seeing things like a movie, a frame at a time. The car stopped and I was supposed to get out, I was stepping into some unknown. One step, two step, three step, four, into the church. What a massive church this is. I remembered walking out of this church a little over a year ago as Mrs. Tanya Meier, standing there with so much joy and happiness. Standing on those steps feeling the warmth of the love from my man standing beside me, feeling the rings on our intertwined hands and the possibilities of our new life and commitment. What am I doing here now? What is beyond these stairs, beyond this door? Do I have to walk into this world that clearly can not be my reality? The answer was yes! My parents were leading me on. They were beside me in this. I see so many people, they are all staring at me. The same people here over a year ago, but now instead of smiles I see so much sadness, I feel their pity, their sorrow, their disbelief, though I am trying hard to not look into their eyes. I don’t want them to see me! I want to disappear. I can’t take it. I ask my sister in law for help, for sunglasses, something to hide behind, shield me. I don’t want to be seen. I put them on and my panic, for some reason starts to calm just slightly. I feel somewhat invisible behind them, though I knew I was not. Pastor Metzger pulls me aside. I will myself to snap out of it. I don’t really hear what he is saying to me, I just nod. Oh, there I see Sherry Massey. Sherry was my pastor, Michael Massey’s wife growing up. She was much more than that though to me and my family. She watched me grow up and also blossom through my walk with the lord, she was there in the celebrated and sorrowful moments of my life, always a support and encouragement. I snap to instantly, I need to speak to her, I was waiting to find her. I told Pastor Metzger I would be right back. Sherry embraces me. I ask “Sherry, can you do something for me?”, her reply “Sure dear”. “Can you read this letter I wrote to and about John during the service? I need you to read it for me and was hoping you would”. I stayed up unable to sleep and wrote this to him in our bed. My tears are sinking in my throat. ‘Sure dear, I will read it”. “Thank you so much, Sherry”. She will never know the true depth of what she did for me, what it meant to hear my word shared, how it brings me to tears to this day, because I knew I could not get up there myself. Pastor Metzger went over the final details and it was time. We walk up about ten more stairs and I see the long rectangular box twenty feet from me. This is real, I am not waking up from this. There he is, there is my beautiful husband, only he is not there anymore, only his body is. I stop at the casket and see him that way one last time. This is not him, he is not lifeless, he was full of life, he was filled with wonder and ideas, with want and ambition. This was not him! This was not us! I tucked a copy of the note I wrote for him into the breast of his coat, said how much I love him. Walking behind that casket through the big glass doors of the packed congregation was the longest walk of my life. Wasn’t I just here, excited and ready to run down this aisle to my beautiful man, the man waiting for me, for us to say our vows? Seeing his eyes filled with tears and with happiness that day, was such an amazing feeling. Now I was barely able to lift my feet and tears and sobs of sorrow, confusion, devastation and brokenness were mine. He was not waiting for me at this alter. I don’t remember much of the service other than my letter. I see Sherry walking forward and prepare myself as my heart, my letter was about to be shared. How do I speak from my heart when it feels so very broken? Where do I find the words to describe the indescribable love we share? How do I find peace when I am just not ready to accept what feels to be unacceptable? How do I gain the strength to move forward when everything feels so backward? You explained our love so perfectly the night you asked me to marry you, when you said “words can’t describe how I feel, it is just an immeasurable feeling that we share”. Each day we loved as if it was our last and for that I will never regret. You have fulfilled my life here on earth though yours was cut short. A look, a touch, a smile, a laugh, was all that was needed for everyone to see how deeply our feelings for each other ran. I am so very grateful for the seven years that we spent growing and learning in love. My heart cries out to you and knows that you are there. Even now, you are my strength, my shining light. Although I do not understand Gods plan for you, I know they were big and it was time for you to go. Your kind and giving spirit have shown so many the deepest joy they have ever known. I could have never gotten enough of you even if we had had the chance to grow old. I feel so empty, lost, alone and scared, but I know that you are looking down helping ease the pain. John, you once told me you wanted to get me flowers and candy, but those only lasted a little while so you gave me yourself. What a wonderful gift to receive. I am so very thankful for the many moments that we just spent being with one another. No words were needed between us because we were one. I felt your heart and you felt mine, we will forever be entwined. You have amazed me with your giving heart. I forever will be grateful for the time we have shared, you have touched my life in so many ways. We have traveled the path together. You are and will always be my perfect match. If there is one thing that I would press upon everyone here, it is to love without boundaries and not be afraid. I never took John for granted because I wanted him to know the deepness of my love for him. We shared so many things that even in silence we knew each others thoughts. Do not take the ones you love for grated and make every moment count. I stood by Johns side through all of this praying and asking God to have mercy on us and I pleaded with him for a miracle. Each night I read psalms to my husband and begged the Lord for his life. It is so very hard to accept what is the unacceptable and know that God’s plan is much bigger than our own. It would be easy to be angry with God, but God has allowed my husband to feel no pain or sorrow, no grief or despair. John was and will always be the strongest man I have ever known. He loved me so deeply and was not afraid to share those feelings. Even in Johns death he is still giving to others through organ donation and will continue to bless and touch so many hearts as he has also done for all of us. Hold tight to the memories you have shared with him. He will be guiding us all through this very difficult time. John, I love you with all that I am and all that I have. I will be with you again in heaven and we will celebrate life everlasting with one another. Love always and never be afraid. 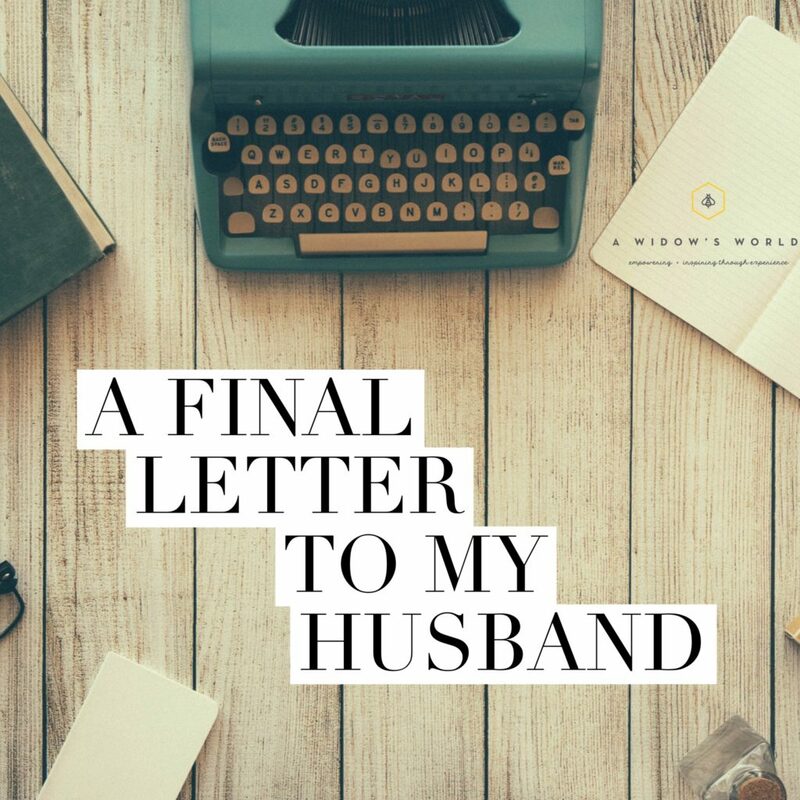 If you have something to share, if you want to write a letter or have your voice be heard at your spouses funeral don’t be afraid to share it and ask someone close to you to deliver it. I am thankful I met a widow who my parents knew, during those terrible days. She went to our church and she encouraged me. Be an encouragement and support to those around you that have lost great love or are going through a hard time. Being vulnerable is scary, sharing your heart is scary, but if it touches even one person or if it is simply a part of your healing, then it is completely worth it.